Ackies was a freshman defensive lineman for the Spartans. Photo from NSUSpartans.com. (NSU Newsroom—Oct. 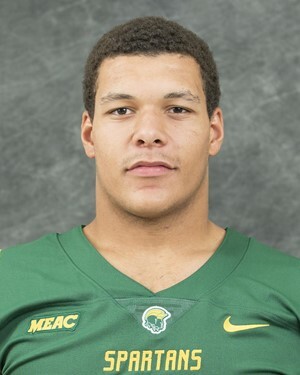 28, 2017)—Officials at Norfolk State University regret to report the death of Nicholas Jerome Ackies, a student, who passed away on Friday, Oct. 27, after he was the victim of a homicide in Norfolk. Ackies, 18, of Richmond, was a freshman criminal justice major. He was a defensive lineman for the NSU Football team. NSU Athletics Director Marty L. Miller expressed his condolences regarding the loss of Ackies. Norfolk Police have arrested JayQuan Anderson, 22, of Richmond, in connection with the incident. Anderson, an NSU graduate, has been charged with second-degree murder and use of a firearm in the commission of a felony. He is being held without bond in the Norfolk City Jail. As the investigation continues, police ask anyone with information about the homicide to call the Norfolk Crime Line at 1-888-LOCK-U-UP. The NSU football team held a moment of silence to honor Ackies in advance of Saturday’s homecoming game against Savannah State University. The NSU Office of Student Affairs will update the campus community when funeral arrangements have been finalized. The NSU Counseling Center staff is available to provide counseling services for students, faculty and staff affected by this tragedy. The center is located inside the Student Services Center, Suite 312. Appointments are available by calling 757-823-8173. For immediate assistance, call 757-823-9000 to speak with an on-call counselor. Tags: football, homicide, JayQuan Anderson, loss, mourn, Nicholas Ackies, Nick Ackies, Norfolk, police, Richmond, spartan. Bookmark the permalink.